Egyptian Mau Cat breed information and advice. Egyptian Mau cat breed information and advice. 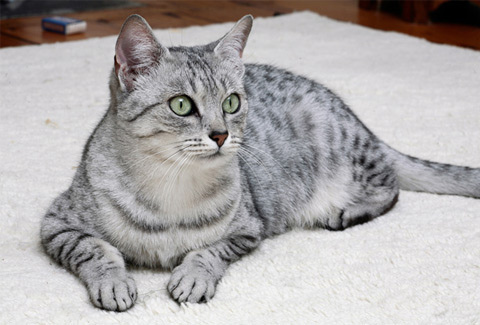 Breed guide to the stunning Egyptian Mau. With a slightly concerned look on their faces, one might wonder what the vivacious and beautiful Egyptian Mau has to be worried about! These stunning cats enchant everyone they meet with their outgoing personalities, and are said to be some of the most admired cats in the fancy with their striking good looks. Melissa Bateson, chairman of the Egyptian Mau Society, was responsible for bringing Egyptian Maus to the UK. She says: "I'd describe Egyptian Maus as moderately active cats and they're very playful, they bond very strongly with their owners and can be quite dog-like; they will follow you around and love to play fetch." In fact, Maus love to play with toys in general, and Melissa says it's very important to have lots of toys and devote plenty of playtime for your Mau, especially toys you can throw and they can retrieve. Jo Higgins, chairwoman of the Egyptian Mau Club, loves these lively beauties: "They are very extroverted and intelligent; they pick things up very quickly. One of mine can open any door in the house, regardless of what handle it has! They can be quite vocal as well, they like to talk to you with a trill and when they want to play, they'll definitely tell you!" For their own safety, as their road sense is not the best - not to mention that they can become voracious hunters if they are let loose - Melissa recommends that they are kept as indoor cats. Egyptian Maus are strikingly beautiful cats and have spotted tabby patterned coats with two or more bands of ticking. They are either silver with grey or black spots, bronze with dark brown or black spots and smoke, which is a dark grey coat with black markings. Their short to mid-length coats are fine and shiny. Maus have large, almond-shaped eyes which are always green in colour, with medium-sized ears and an M shape on the forehead. They are strong, muscular, medium-sized cats with medium-length tails which taper slightly towards the end. Maus are one of the oldest cat breeds, as it is believed they are descended from the ancient street cats who were first domesticated in Ancient Egypt. They were first recorded in Europe in Italy just before World War Two and were imported to the USA in the 1950s where breeders worked hard to establish the breed over the following 30 years. Melissa first spotted the breed in a book when she was around 10 years old and fell in love with them, and vowed that one day she would own one - a dream that was to come true when she moved to the USA in her late 20s and bought a kitten from a breeder in Virginia. She then collected six unrelated Maus and brought them back to the UK with her in 1998 and founded a breed club, working together with other breeders to have the breed accepted by the GCCF. As with all breeds, make sure you visit the breeder's home and see how the kittens are being raised. Melissa says: "It's very important that Maus are raised with people in a home environment and not shut in a pen; they need to get used to household sounds. Egyptian Maus can become very shy if they are raised alone so it's important that they are well socialised." Jo adds that it is very important to do your research into the breed before you visit the breeder, and always choose a reputable, GCCF registered breeder. Expect to pay between £400 to £600 for a pet quality Egyptian Mau kitten, but the price could be more for a show kitten. Egyptian Maus have a very low maintenance grooming regime as they are shorthaired, so just a weekly groom, or a once-over when they are moulting, with a rubber brush is plenty to keep them looking their best. Jo adds: "One of the most effective things I've found to remove loose hairs is to cut the feet out of a pair of tights and run it over their fur. A silk scarf or a chamois leather is also great to make their coats shiny." As there are very few breeds that Maus are allowed to be outcrossed with, Egyptian Maus are not known to suffer from any inherited health conditions. Reports have surfaced that Egyptian Maus are carriers of the gene which causes pyruvate kinase deficiency (PK Def), but Melissa is keen to stress that there is no evidence that Maus have suffered from any illnesses associated with this gene.